The pecs are actually separated into three distinct heads that divide the upper chest, lower chest and middle chest. The heads that accomplish this are the clavicular head at the top, the sternal head in the middle and the often overlooked abdominal head at the bottom of your chest. Through varying orientations of the upper arm, you can influence the fibers of each to a greater or lesser degree. In this video, I am going to show you how to better activate the lower chest by paying attention to the way you do your crossovers. Cable crossovers are a popular exercise for sculpting a better and bigger chest. It is common to see people grab the handles from down below and lift up and across their chest to try and build a better lower chest. The problem is, this defies the anatomy of the pectoralis major. In order to influence the lower chest more than the upper chest you would actually want to do the opposite and start with your arm high and bring it low. Here I demonstrate how the lower or abdominal portion of the pecs line up and how you can take advantage or their orientation to better activate them during adduction of the arm. 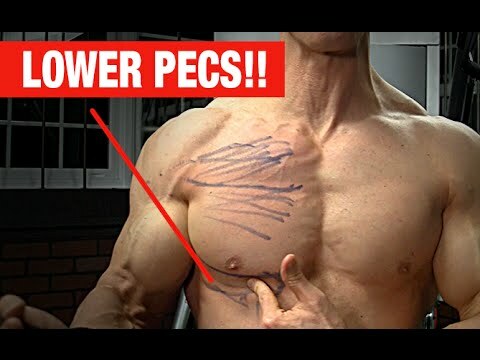 Of course your pectorals contract all or none in the sternal portion of the pecs (the upper chest may actually have a slightly different contraction pattern due to the fact that it has a separate nerve innervation). That being said, because the upper arm position can be changed in all three dimensions, it is possible to provide some fibers with specific orientations, a better line of pull than others. To hit the lower portion of your chest more you want to set up a cable station in a high position. This can easily be performed at home without elaborate equipment by simply attaching a resistance band to a pullup bar. Whatever you choose, you want to grab hold of the band or cable handle with one hand and step away from the machine. Here you want to rotate your shoulder externally by taking an underhand grip on the handle and making sure to let your shoulder roll back and down. From here, you want to focus on the movement of the elbow as you try and bring it across your chest (into adduction) and head towards the top of your abdominals on that side. With the lower portion of the chest inserting into the aponeurosis of the abs and obliques you want to be sure to target this area as your end point or destination for your elbow if you want to get at that lower chest. Feel the strong contraction of the lower portion of your chest and return the handle to the starting position slowly. Be sure to emphasize the strength and quality of each contraction rather than the number of reps that you are performing if you want to see better results from this lower chest exercise and get better lower pecs. For a complete program on how to build an impressive middle, upper and lower chest while getting six pack abs and explosive legs, be sure to head to http://athleanx.com and learn how to start training like an athlete. Get the same exact program used by today’s top professional athletes from all major sports who want to get ripped, athletic bodies and perform at the top of their game. You Can’t Build Muscle Over 35 Without TRT!